Publically documenting my progress towards changing my sleep habits is quite humbling. I would love to say that from day one, I immediately stopped what I was doing at a certain time and went to bed at my desired goal time. It would not be true, however, it is true that I’m making substantial progress and am getting to bed much sooner (as in hours sooner). It is eleven p.m as I type these words. This is the time I have told myself I will walk away from whatever it is I am doing so that I can start my “sleep routine”. I know that nothing terrible will happen if I do not finish this post tonight. With that thought in mind, I will continue writing tomorrow. A new day, and a new opportunity to engrain a revised sleep pattern into my life. Something that will eventually happen on “auto pilot”. When I ended my post last night, I logged off, but I still spent almost nine minutes from that time to the time I walked away from my computer. I couldn’t resist checking twitter. I had a few new followers and just “had” to look to see who they were… Sigh. Time to circle back to the thirty-four year old woman who quit smoking, lost forty pounds, was promoted at work AND ran a marathon! Wow, what changed? When we were first introduced to Lisa, her husband had just left her for another woman and the rest of her life was somewhat of a mess in almost every area. At a very low point, she booked a trip to Cairo, and while she was there, had a crisis moment that led to an epiphany. While half asleep, she lit what she thought was a cigarette only to find herself inhaling burning plastic. When she realized that she lit a pen, something inside of her urged her to take control of at least one thing in her life. This was the catalyst to not only finally quitting her smoking habit, but also starting on a four year journey that led to an “Extreme Life Make-Over”. When Lisa stopped smoking, she started running which led to a ripple effect that affected almost every aspect of her life. In addition to the transformation mentioned earlier, she also started working on a masters degree, turned he finances around and bought a house. All from one keystone habit – the type of habit that has the power to transform the way we think and perform at every level. As I was reading this particular story, I knew that my keystone habit was my sleep routine – or lack thereof. Constantly being sleep-deprived does not put you in a peak-performance state of mind or body- quite the opposite. The week that I spent in front of my computer not being able to tear myself away scared me. I don’t like the feeling of being unable to control my actions. When I’m training for a half-marathon, I am extremely disciplined in doing all of my training runs, eating right, following my training plan. My weak spot is always sleep, but never anything close to what I found myself doing now. I knew I had to change. Last Tuesday was the official start to changing my sleep habits. Most nights, I was able to get to away from my computer/laptop/phone within 15 to 30 minutes of my goal time. Saturday was the toughest because it was like being a kid again – no school (work) the next day – I was allowed to stay up as late as I wanted on the weekend right? Nope. Not if I want to change this habit. 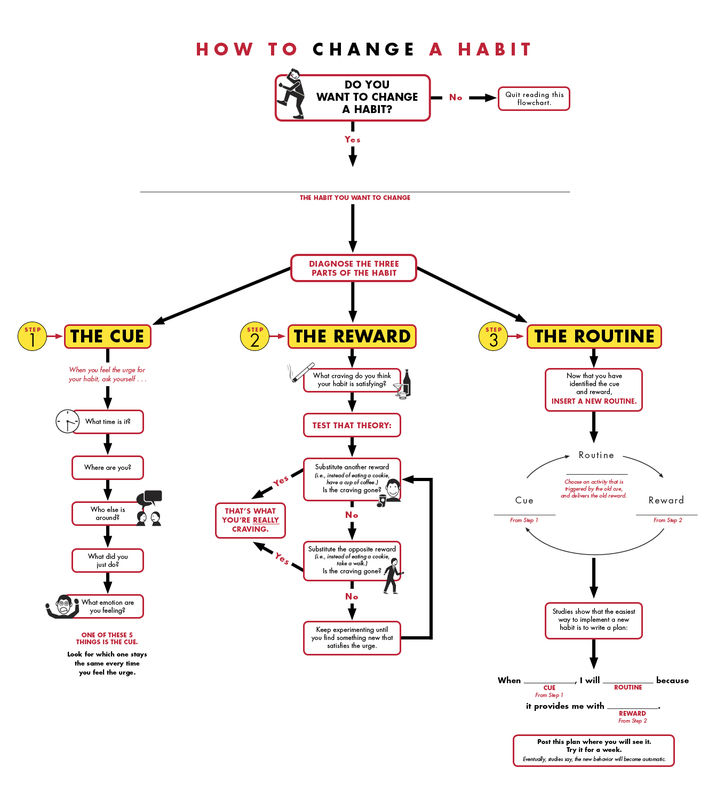 I still hadn’t perfected my new routine – the part of the “habit cycle” that is critical to changing a habit. Enter my decision to become a member of Partrick Combs’ MIGHT Program. I’ve been following Patrick for a while because I love his energy and passion in all that he does. I was introduced to him via an interview about public speaking and as I listened to it, he was doing everything that I aspire to do. The MIGHT program didn’t exist at that time. In a “when the student is ready, the teacher will appear” moment, I came across Patrick’s new company and sat on the fence for far too long. As I was working on what I could do to change my routine, I took a hard look at the program and went for it. It’s been exactly what I need. A community of like-minded people, and a proven process to make measurable progress on your most important goals – all within a set period of time, with very specific, meaningful actions to reach that goal. It’s not your ’80s guru goal-attainment hype. It’s the new routine that not only gives me my reward – it gives me an even BETTER reward because I’m working more effectively in a shorter period of time. I’ve decided to use the Power of Choice to get me through this. I will post updates from time to time, but I feel confident that I’m on the right path. What about you – what’s working, what’s not? Please share your thoughts below.